We have five Hotels in Bournemouth, each with their own distinct style and location. suitable for either a short walk to the idyllic East Cliffs, or easy access to Bournemouth town centre. 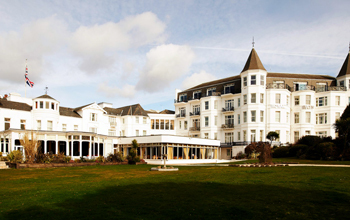 The Royal Bath Hotel was the first Bournemouth Hotel to open, so naturally it has a fantastic position on the seafront, offering panoramic views of the hotel gardens, sea and Bournemouth Pier. However, each of our hotels has its own unique offering, be it a town centre location, landscaped gardens or easy access to coastal walks. Perfect for every occasion, Britannia's Bournemouth hotels have a range of facilities, including conference rooms, leisure areas, heated pools, activities, restaurants and much more. So whether guests choose to stay in the centre of town or further a field, they never need to go far to find everything they might need. Travellers looking for a short break stay in the beautiful coastal town of Bournemouth should therefore consider booking with Britannia. Our prices are checked against guest houses, local B&Bs and other Hotels in Bournemouth, giving our gusts the best possible deal to make their stay even more enjoyable.